Cross posted from From Auschwitz to Skokie where I discuss my recent trip to Poland to study Jewish history, heritage, memory, and the Holocaust as well as my work with the Illinois Holocaust Museum and Education Center in Skokie, IL. Historic preservation is an important aspect of the work that many Public Historians in the United States do. So important, in fact, that my program requires all Public History students to take a course on historic preservation, which I took last semester. Ask me about the National Historic Preservation Act of 1966, particularly Section 106, and I can bore the pants off of you with information about the federal government’s role in historic preservation. Then, of course, there are all the state and local regulations that impact historic preservation efforts as well. Eugène Emmanuel Viollet-le-Duc, a 19th century French architect and theorist, was a proponent of the idea that historic buildings should be restored to a finished state. Often this involved restoring the buildings to a specific time period, but in some instances Viollet-le-Duc noted that this might mean restoring the building to a state that never actually existed. In contrast, his British contemporary John Ruskin held the opposite view. For Ruskin, the power of a building lay in its age, not in its grandeur. He did not believe buildings should be restored to any one period of their past, but should instead be conserved or preserved in their current state. Basically, a historically relevant building shouldn’t be allowed to be destroyed, but it also shouldn’t be artificially brought back to its former glory. The final option, which doesn’t have a cool 19th century European proponent, is adaptive reuse. As the name implies, this theory holds that buildings or sites should be preserved but should also be made useful to the public. In making a building or site useful and meaningful to the current population, this often means using it for something other than its original purpose. Poland has provided unexpectedly fertile ground to explore the various debates over historic preservation in exploring how synagogues are treated in modern Poland. Jews in Poland today make up less than 1% of the total population, but before the Holocaust, made up 10-12% of the Polish population. As one can imagine, this meant a lot of synagogues. Rather surprisingly, many of these synagogues still exist today, but their communities do not have a Jewish presence to utilize them. The Old Synagogue in Krakow (c. 1407), the oldest surviving synagogue in Poland. 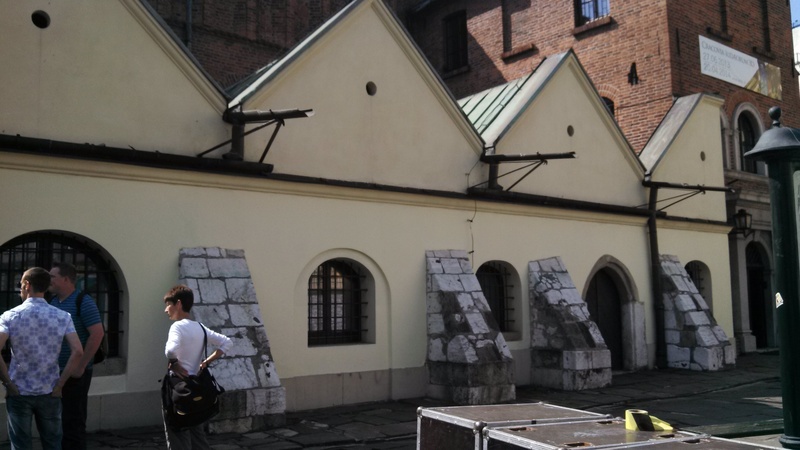 Izaak Synagogue in Krakow (mid-17th century) – Like many synagogues that survived the war, Izaak Synagogue was used as a warehouse by the Nazis. When there are so few Jews left in the country, the question becomes what should become of all of the former synagogues that remain? In Krakow for instance, which does have a Jewish community, there are far more synagogues than the community could actually use. 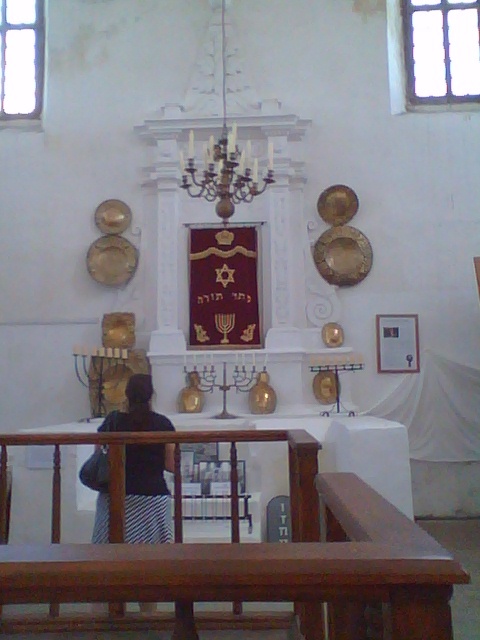 Because of this, only two of the synagogues have been restored. Remuh Synagogue (mid-16th century) and Tempel Synagogue (c. 1860) have both been restored to a pre-WWII state and are in use today as synagogues for the Jewish community in Krakow. Tempel Synagogue (c. 1860), one of the few active synagogues in Krakow. Tempel Synagogue, like Izaak Synagogue and many other surviving synagogues survived WWII because it was used as a warehouse and stable by the Nazis. 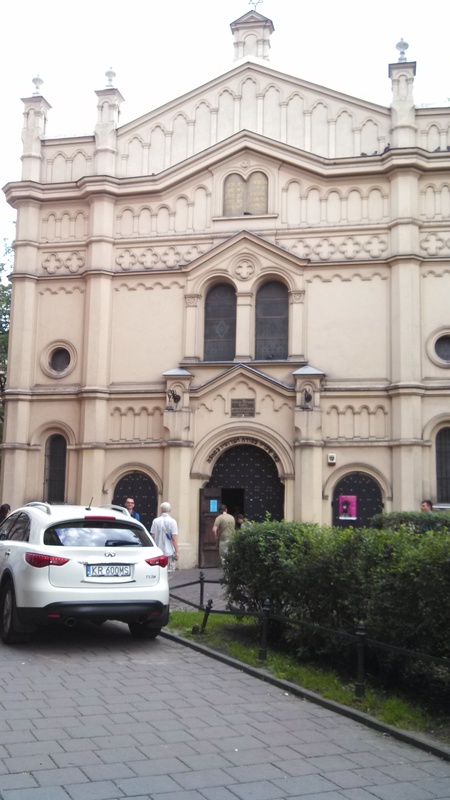 The only Reform Synagogue in Krakow, this building underwent a major restoration effort in 1990 with financial assistance from the World Monuments Fund. 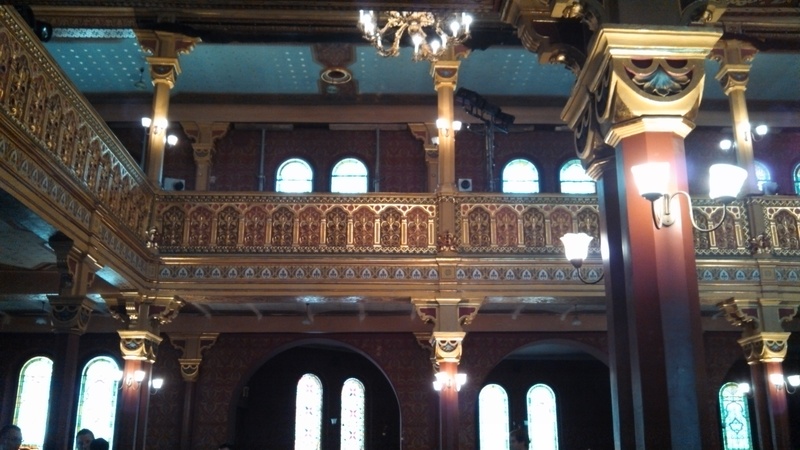 Tempel Synagogue, restored to its original Neo-Moorish interior. 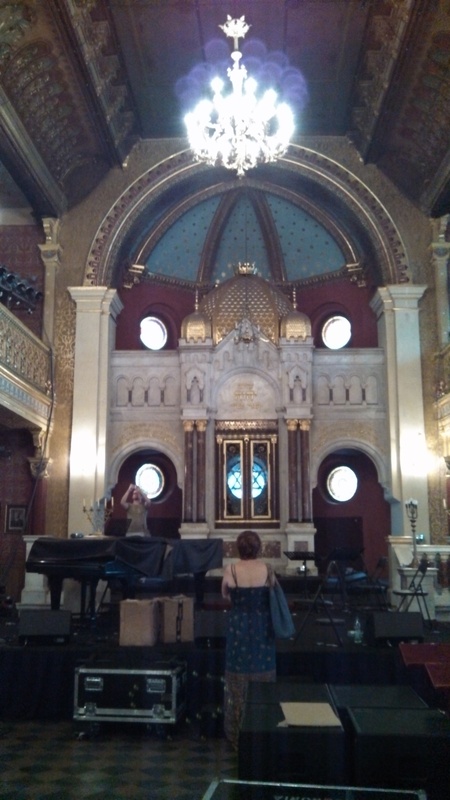 Without support from the World Monuments Fund, the restoration of Tempel Synagogue would likely have been impossible. Most communities in Poland, however, are not like Krakow. While Krakow does have an active Jewish community, most small towns do not have any Jewish inhabitants today, but they do have synagogues. What is a community to do with a synagogue when there is no Jewish community left? The communities in Szydłów and Chielnik have answered this question by turning their former synagogues into museums to the once vibrant Jewish community of their town. The tiny village of Szydłów (population about 1,000) was once 30% Jewish at its height in the 19th century. 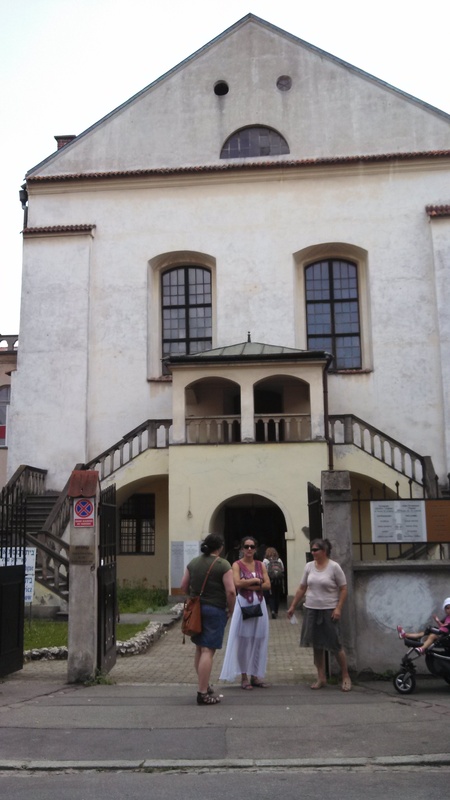 The synagogue located here was built in 1538 and is one of the oldest remaining synagogues in Poland. The Jewish community of Szydłów was almost entirely whipped out when most of them were sent to their deaths at the Treblinka death camp in 1942. 6 Jews from Szydłów returned at the end of the war, but they were killed, perhaps in the wave of violence that swept Poland after the Kielce pogrom in 1946 (for more information about this post-war outbreak of anti-semitism, see Jan Gross’ book Fear). Today, there are no Jews in Szydłów, but the synagogue remains as a museum with artifacts and photographs that inform the visitor about Jewish culture and the Jewish community that once lived there. A view of the arch at the Szydłów Synagogue, which is now a local museum. The town of Chmielnik had an even larger Jewish community than Szydłów. In 1939 on the eve of the Second World War, about 10,000 Jews lived in Chmielnik, about 80% of the population. After the war 14 Jews returned to Chmielnik, but they were among the 100,000 Jews that emigrated from Poland within a year of the Kielce pogrom in 1946. The entire town is significantly smaller now, with a population of only about 4,000 people. 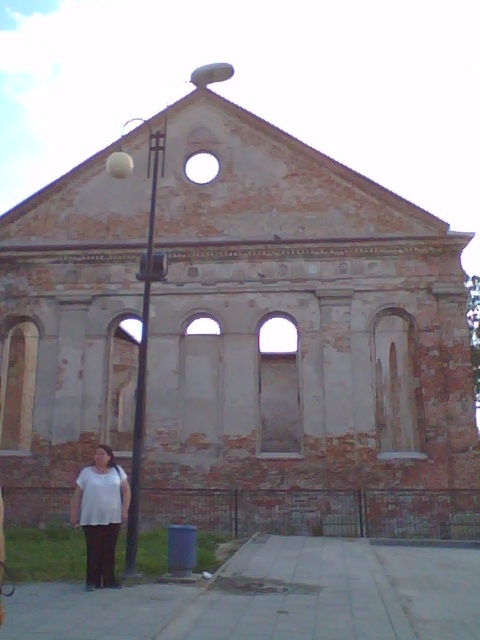 A few years ago Chmielnik’s synagogue was abandoned and in considerable disrepair. It has now been renovated and is in the process of becoming an excitingly professional museum for such a small town. 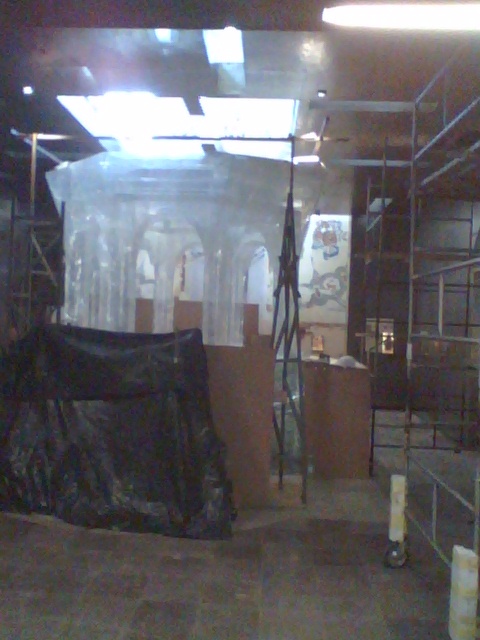 Construction-in-progress of the museum in the Chmielnik Synagogue. 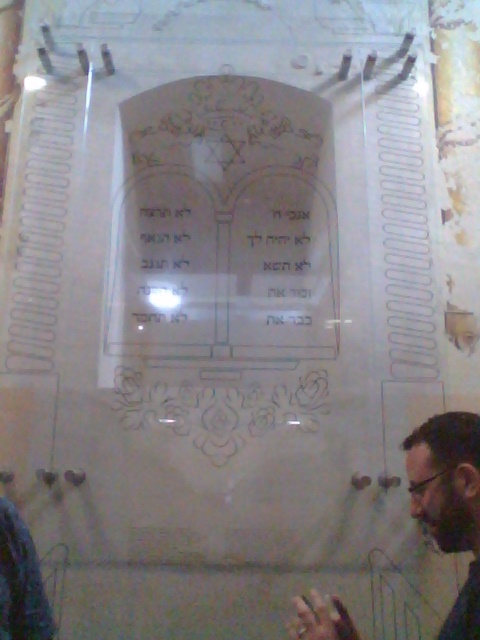 The museum includes a glass Bimah reconstructed after the original. Finally, there is the last option: conservation of a building in its current state. I purposefully saved this example for last, because it was the last destination we visited in our tour of small towns and villages in the Krakow area. Działoszyce is another tiny village that today has a population of only about 1,000. It was an almost entirely Jewish town that, before WWII, had a Jewish majority since 1765. In 1939 80% of the population of Działoszyce was Jewish. In 1941 Jews from Krakow, Warsaw, Łódź, Poznań, and Łask were moved to Działoszyce and the entire town became a ghetto. On September 2, 1942 15,000 of the inhabitants of the Działoszyce ghetto were sent to Belzec to be murdered. A few hundred Jews were able to escape this deportation and joined partisan groups in the woods that fought the Nazis until February 1944 when they suffered huge losses in a battle against the Nazis. 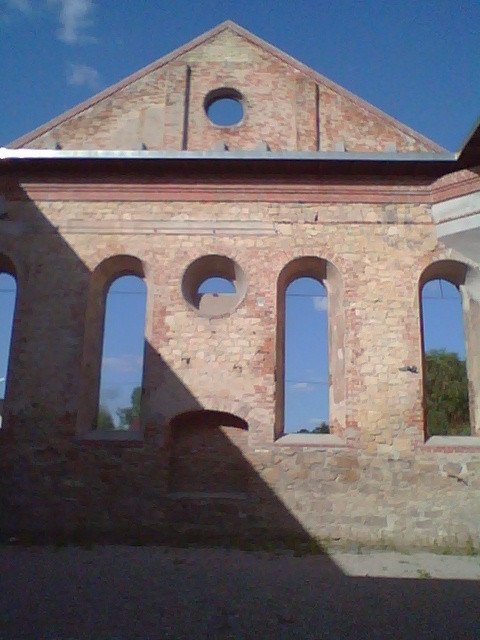 The synagogue in Działoszyce has not been restored, nor is it being used for any other purposes. Instead, the synagogue is in complete ruin. There are no windows or doors remaining and the roof is also missing. Some years ago the building was in similar disrepair and some members of the community used it as a dumping ground for rubbish. Today, the rubbish can no longer be seen in the synagogue and it is kept locked to keep out unauthorized visitors and preserve the ruins from further destruction. Additionally, protections have been made to keep the ruins from further deterioration. Exterior of the Synagogue in Działoszyce, built in 1852 in the Neo-Classical Style. Interior of the Synagogue in Działoszyce – visible are some of the protections put in place to keep the ruins from deteriorating further. There aren’t any plans to restore the Działoszyce Synagogue, nor to put it to any other use. Instead, the Działoszyce Synagogue is an eerie reminder of the destruction of the Holocaust and, perhaps, an even more powerful symbol and memorial than the other synagogues I have seen throughout Poland. Why the heck did I choose_____________as my research topic?